Why host an Ontario Games in your community? Increase economic activity and tourism to the community and region. Thousands of participants and their families will travel to your community resulting in significant local spending. Build your local sport hosting resume. The Games provide an opportunity to demonstrate the community’s capability to host sporting events both big and small. Develop a strong base of qualified volunteers in the community who will support future sport hosting opportunities. Build community spirit and pride. The Ontario Games provide a rare opportunity to host participants from all regions of the province. Opportunity to host a unique sporting event with unprecedented support. Ministry staff will support your community like no other sporting event. How does Games Ontario support host communities? Delivering an Ontario Games is a tremendous but rewarding undertaking for host communities. All Ontario Games are delivered in partnership with Games Ontario. An advisory team will support host communities every step of the way. Together, Games Ontario and Ontario Games hosts will work closely to deliver a successful Games and continue to grow the Ontario Games program to be Canada’s premier provincial sporting event. All Ontario Games hosts will receive a hosting grant from the Province. Grant amounts are paid in installments to help off-set the costs of hosting the Ontario Games. The grant, along with participant registration fees and host generated revenue (municipal contributions, other grants and sponsorship), cover the expenses of hosting the Ontario Games. A portion of the total funding provided by the Province is allocated for a host community legacy or a contingency in the event of a deficit. Should a host community run a deficit, the additional funds can be accessed to reduce a deficit up to the maximum identified in the table above. If no deficit occurs, the host community would receive the full amount to be used for agreed upon Games legacy initiatives. As a part of hosting the Games, communities will receive a package of best practice and transfer of knowledge resources that will provide: job descriptions for committee chairs, organizational charts, critical paths, templates and other resource documents. All resources are reviewed by Games Ontario and updated to ensure they reflect the best practices of hosting multi-sport Games in Ontario. Other equipment: extension cords, power strips, tents, etc. Communities interested in submitting a bid for any of the five Games are required to submit a Letter of Intent to Games Ontario by the date outlined in the Bid Timelines. The Letter of Intent will provide an opportunity for Games Ontario to consult with your community to provide assistance in preparation for the bid. Note:Submitting a Letter of Intent does not commit a community to submitting a bid. It provides an opportunity to consult with Games Ontario to discuss specific aspects of your bid and to ensure that you are able to put forth the best bid for your community. To ensure a fair and equal bidding process, questions and additional information about the Games will be shared with all communities who have submitted a Letter of Intent. Communities must prepare a bid submission that includes all items listed under the “Elements of your Bid Submission” found within this document. At least one hard copy and one electronic copy of the bid submission must be received by the deadline set out in the Bid Timelines. Original copies of each letter of reference are required in the hard copy version of the bid submission. Games Ontario staff will appoint a Site Review Committee (SRC), which will evaluate each bid submission based on the requirements outlined in “Elements of Your Bid Submission.” The SRC may comprise of individuals from MTCS, Provincial Sport Organizations (PSOs) and professionals with experience in hosting multi-sport games. In addition to an SRC, the Ontario Senior Games Association (OSGAM) will be directly involved in the evaluation of bid submissions for their respective Games. The SRC will identify a short list of communities for site visits based on the written bid submissions and evaluation completed by the SRC. The site visit provides the SRC with an opportunity to further assess the strengths and weaknesses of each bid submission. In addition, the SRC will be provided with an opportunity to ask any questions and get clarification on the bid submission. If required, any requests for further details or clarifications by the SRC must be submitted within one week of the request. The site visit provides the community an opportunity to strengthen and enhance components of their written bid submission. After completion of the evaluation process, a recommendation will be put forward for approval to the Minister of Tourism, Culture and Sport. Upon receiving final approval, Games Ontario will notify the successful community and make arrangements for a formal announcement. The bid submission must provide a clear indication of how your community would successfully host the Ontario Games. Each of the following sections summarizes the critical areas of responsibility to ensure the successful delivery of the Games. Each area of responsibility includes a list of mandatory requirements; failing to meet the mandatory requirements will result in a bid submission that is incomplete. The delivery of the Games is a partnership between the host community, Games Ontario and/or the Ontario Senior Games Association. It is an exciting opportunity to showcase your community to the rest of the province. It is important to provide a rationale for your community’s decision to bid for one of the Ontario Games. Each host community will be responsible for forming a Games Organizing Committee (GOC) and developing a transition plan from the bid selection to a working GOC. The GOC will be comprised of dedicated volunteers who deliver on the various components of the Games. Why should Games Ontario consider your community over others? What are the potential outcomes the community is looking to achieve in hosting the Games? Resolution from municipal council indicating support for the bid. Proposed or anticipated financial contribution from the municipal council. Other letters of support from community partners. How/when will the GOC Chair be selected? How/when will a Games General Manager be selected? How will GOC members be selected? Transition plan for the community to move from the bid submission to a working GOC. MTCS provides operating grants for each of the five Ontario Games. Please refer to Appendices for a summary of expenses that the operating grant must be used for when delivering the Games. In addition, each Host Community will collect registration fees outlined below for each participant. The total registration fees will vary based on the final number of participants. Games Ontario cannot guarantee the number of participants. *Games Ontario reserves the right to modify registration fees 12 months prior to the Games. Registration fees for Summer and Winter Games vary depending on the length of sport competition. Major officials for all Games do not pay a registration fee but they are provided with meals and accommodations. Coaches and team managers for the Ontario Winter/Summer Games and Ontario Parasport Games do not pay a registration fee but they are provided with meals and accommodation. District Coordinators for the Ontario 55+ Games pay the participant registration fee and are provided with meals and accommodations. All bid submissions must use the template provided and include all budgetary calculations. Ontario Winter/Summer Games, Ontario 55+ Winter/Summer Games must include a General Manager position. Potential sources of revenue generation, including a breakdown of confirmed revenue (hosting grant, registration fees, municipal contribution (if confirmed), and unconfirmed revenue (other grants, sponsorships, etc.). Risk Management Plan, including plan if the Games are in a deficit situation. Games Ontario will develop a sport selection application process for all recognized Ontario Provincial Sport Organizations. The purpose of the application process is to ensure that all sports are using the Games as an integral part of their athlete, coach and official development. A final sport list including anticipated participation numbers will be provided to the host community at least 12 months prior to competition. Communities can anticipate up to 3,500 participants in 25 sports at both the Ontario Winter/Summer Games and up to 550 participants in 10-12 sports at the Ontario Parasport Games. In consultation with the Ontario Senior Games Association, sports will be selected for each Ontario 55+ Games. The designation of events is determined using the most current participation statistics and trends within older adult participation. This breakdown, along with the maximum number of participants, will be determined at least 12 months prior to the Games. A list of current sports and participant numbers for all five sets of Games is outlined in Appendices. In addition, sport technical information specific to each sport is outlined in Appendices. Communities can determine the feasibility of hosting a set of Games by completing the Venue/Sport Evaluation form included in the appendices. A bidding community is required to complete one form for each sport, identifying how their designated facilities meet the technical requirements. It is the intention that a selected community will have the ability to host all the sports selected for the Games. However, MTCS understands this is not always possible and should not deter a community from bidding on the Games. Being able to accommodate all sports will impact the grading of a bid but is not the sole determinant in selecting a host. Each host community is responsible for obtaining (through purchasing, renting or borrowing) and transporting all the necessary equipment required for each sport. The GOC will work directly with the PSOs and Ontario Senior Games Association to identify and secure necessary equipment. Most equipment required to host the Games can be borrowed from PSO’s or local sport clubs, with the GOC being responsible for transportation costs. Important: Games Ontario reserves the right to alter the sport list and participant numbers up to 12 months prior to the respective set of Games without exceeding the maximum of 3,500 participants for the Ontario Winter/Summer Games. 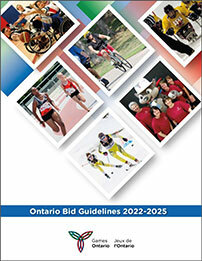 There is a possibility that a sport will apply to be included in the Ontario Winter/Summer Games that is not included within the bid guidelines. If they are selected to be included in the Games, Games Ontario will consult the host community on their ability to provide the necessary venue. Be creative when determining how to play host to all the sports for the Ontario Winter/Summer Games; consider hosting the event on back-to-back weekends, or consecutive days (Tuesday-Thursday & Friday-Sunday) or partner with surrounding communities to host all sports. Consult with Games Ontario to generate some ideas on how your community can meet the needs of the sports for each set of Ontario Games. Secure tentative contracts or written agreements with designated venues: doing so will enhance your bid submission. A Venue/Sport Evaluation form for each sport identifying designated venues (i.e. – playing surface dimensions, length/width/depth of the pools, etc.). A map outlining facility locations; including travel distances between proposed accommodations and venues. Identify the proposed dates of the Games. Identify a plan for collection and management of results. Athletes, coaches, athlete assistants and team managers will reside within close proximity of one another to create an “Athletes’ Village” atmosphere. University residences, close hotels, etc., work well to create this atmosphere. All linens and pillows must be provided by the host community. In a standard room at a hotel, there should be one person per bed with a maximum of three people per room. Due to varied sport schedules, no more than one team or sport can be roomed together. For example, participants must be separated by sport, team or region where possible. Participants must be separated by gender within rooms. Ideally, genders will be separated by floors in their respective accommodations. Coaches and athletes cannot share rooms unless in a dormitory style setting, in which case two or more adults may be accommodated in a dormitory with minors. Accommodations must be made available to participants for the duration of the Games, which includes the Opening Ceremony up until completion of their competition. Athletes’ performances are very dependent on the quality and quantity of the food they receive. As many sport competition schedules differ from one another, it is important to be flexible to meet the needs of all sports. It is also important that all meals are well balanced and nutritious. Plenty of water and snacks must be made available as well. Games Ontario requires all host communities to provide three meals per day based on the Meal Requirements and Guidelines, which can be found in the Appendices. In a hotel setting, if larger than standard rooms are used to accommodate participants, the maximum number of participants per room can be negotiated with MTCS. Securing tentative contracts or written agreements with designated accommodations will enhance your bid. Accommodations rates may increase after the Ontario Games are awarded, commitments on rates assist in providing certainty in budget numbers. Connect with accommodation and food service providers to ensure accurate budget numbers are reported in the bid. Past host communities have understated their accommodations and food services budget resulting in immediate pressures on their budget. Participants will check out of their accommodations on the morning of the last day of competition for their sport. However, additional accommodation nights may be required for participants travelling long distances after the conclusion of competition. Identify proposed location(s) for the Athletes’ Village, including negotiated rates. Identify accommodation location(s) on a venue map. Address all requirements outlined above and how they will be taken into account when selecting accommodations and food service providers. External Transportation – All participants are responsible for organizing their own transportation to the host community but the host community is required to adopt the travel policies specific to each set of Games. Please see Appendix: Games Travel Subsidy Policy for more information. As per the policy, all host communities must make all necessary arrangements to pick up participants at the closest airport, train, or bus station. Internal Transportation – It is the responsibility of the GOC to make all necessary transportation arrangements to and from venues, accommodations and special events for accredited Games participants. The internal transportation schedule must take into account the competition schedule of the sports and what would provide an optimal competition environment for the athletes. Communities can consider multiple transportation options, such as municipal buses, school buses and motor coaches. Each sport will require their own unique transportation schedule. Certain sports will require one transport to the venue in the morning and one to the hotel in the evening and other sports will require a shuttle throughout the day. At the conclusion of the competition, no transportation is provided except to participants going to the airport, train or bus stations. Connect with transportation providers to secure written commitments to ensure accurate budget numbers are reported in the bid. Provide a transportation plan for accredited Games participants to and from accommodations to sport venues and special events (Note: Accessible transportation must be provided for the Ontario Parasport Games, Parasports/para athletes integrated into the Ontario Winter/Summer Games and as required at the Ontario 55+ Summer/Winter Games). Identify how transportation will be managed during Games. Identify the closest airport, train and bus station, and how participants will be transported to and from each. A plan to recruit, train, coordinate and recognize the volunteers. Outline how volunteers will be fed during the Games. A plan for volunteer screening before the Games. A plan for volunteer clothing. Identify sport groups or clubs that would have volunteers available to provide technical support during the Games. Identify how volunteers with specific qualifications would be recruited (i.e., medical, security, etc.). An important part of hosting the Ontario Games is building awareness within the community and province wide. This is accomplished through a comprehensive marketing and communications plan. This can be done through television, radio, print ads, website, social media and much more. In accordance with the French Language Services Act, it is important that many of the materials for the Ontario Games must be available in both official languages. As the primary funder of the Ontario Games program, the Province of Ontario, and the Ministry of Tourism, Culture and Sport, through Games Ontario, is recognized in all Games related materials and communications. Host communities are required to build their own website and secure their own domain for their Games. Identify how you will raise awareness and interest for the Games. Include a marketing and social media plan. Identify a plan to address French Language Service requirements. The Opening Ceremony is an opportunity for the host community to be creative and set the tone for the Games. For many athletes, the Ontario Games is the highlight of their athletic career and this is an opportunity to recognize them and their achievements. In addition, it is also an opportunity to recognize the support of sponsors, friends and family, and the community for everything they have done to make the event possible. Identify suggested program and a proposed venue for the Opening Ceremony. Identify potential activities and plans for a Middle Night celebration (Ontario 55+ Games only). Provide a plan for a VIP Reception during the Games. Identify if any other special events are planned either pre, during or post Games. Each host community is required to procure a registration system for participants and volunteers of the Games. The host community will work with Games Ontario on the registration process. It is also important that all participants and volunteers are properly identified and accredited in order to participate in the Games. On-site registration is the first impression participants have of a Games, therefore an effective and efficient plan will have a positive impact. Identify plans for online Games registration for all Games participants and volunteers. Provide a plan for on-site registration and accreditation pick up. The need for medical support during any Games is essential. It is important to develop a plan for both first aid and medical emergencies. Enhanced medical services such as daily athletic therapy can be considered. A minimum standard of basic first aid equipment and dedicated medical personnel are required at each venue. Provide an overall medical plan for the Games. Identify medical professionals in the community that will commit their support to the Games (i.e., physiotherapists, athletic therapists, doctors, paramedics etc.). Identify local hospitals and medical services available in the community. Identify plans for any other medical support (i.e., physiotherapy/medical clinics at the Athletes’ Village). What additional things can my community offer that will add to a participant’s experience? What can my community do to assist with athlete, coach and official development during the Games? For example, training clinics, information sessions and mentorship programs. What will participants do in the community during downtime in the evenings and in between competitions? What opportunities can the community provide to allow for cross sport interaction? For example, providing the opportunity to spectate other sports, central feeding locations, etc. Identify how the community plans to contribute to the participant experience. For example, clustering through the Athletes’ Village, hosting additional social events, athlete/coach educational events and opportunity to spectate other sports. Identify any initiatives that will make the participant experience unique to your community. A legacy is important for the host community once the Games have come to an end. The Ontario Games should have an impact on the community before, during and after the Games. Communities need to develop a legacy plan and consider what legacies will result, both directly and indirectly, from hosting the Ontario Games. What sort of legacies does the community expect from the Games? What sort of legacies does the community need? If there is a financial surplus at the conclusion of the Games, how will it be managed? What projects would be under consideration? Identify a legacy plan for your community, how will it be achieved? What resources will be committed? How the community will ensure the legacy plan is executed after the Games. As the Province’s largest multi-sport games, hosting an Ontario Games is an extremely rewarding venture for a community. Each host community receives unparalleled support from Games Ontario throughout all stages of the Games and we look forward to working with you! Interested in learning more? Considering a bid? Connect with Games Ontario (Games.Ontario@Ontario.ca) to receive Ontario Games appendices, which provide more information and technical requirements of hosting. Discuss which Ontario Games may be right for your community with Games Ontario staff. Games Ontario will support all communities. Has your community hosted an Ontario Games in the past? Would your municipal council support the event? Can your community meet the financial requirements of hosting? Does your community have the necessary sport venues to host? Can your community provide accommodations for all participants required for the Games? If you are uncertain about your community’s ability to bid, Games Ontario encourages submitting a Letter of Intent while you further investigate a potential bid. Games Ontario welcomes all new and previous host communities to inquire about and bid for the 2022-2025 Ontario Games.